now available for download as well. 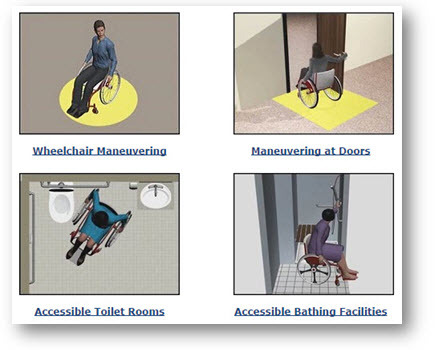 These animations, which are part of an online guide on the standards, address wheelchair maneuvering, doors and entrances, and accessible toilet and bathing facilities. As an alternative to viewing them on the Board's site, visitors now can download and save copies of each animation. "The response to the animations we produced has been very positive," states Access Board Executive Director David M. Capozzi. "We are making them downloadable to make it easier for users to store and share this material." The animations, like other information issued by the Board, is in the public domain and can be copied and freely distributed. The Board plans to develop additional animations in this series. 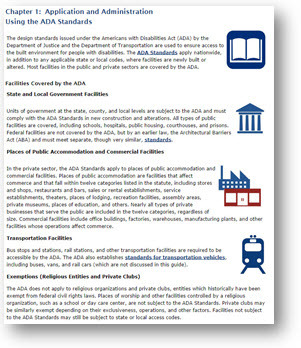 The online guides also include illustrated technical bulletins that explain and clarify requirements in the ADA Standards and the ABA Standards. Bulletins released to date cover the first three chapters of the standards, including application and use of the standards (Chapter 1), scoping in new construction, alterations, and additions (Chapter 2), and basic "building block" technical provisions (Chapter 3). Guides covering other sections of the standards will be released at a later date.